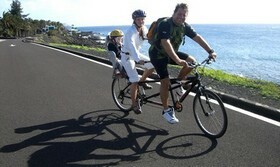 Tommy's Bikes Lanzarote - bicycle, mountainbike, roadbike rental and excursions on Lanzarote - our mountainbikes. Our Mountainbikes - hardtails and fullsuspensionbikes from Specialized, BMC, CUBE, FOCUS, GIANT and TREK - will supply you with best handling, components - and maintainance. We offer high-quality-e-bikes (city- and mtb-type) on request. TANDEM from DAWES - let's pedal together! city- and hybridbikes come with racks. childseats on extra-charge avaliable.